At first, I was tempted to describe writer/director Cristian Mungiu's “Graduation” (2016) as a naturalistic film that unfolds at a leisurely pace while observing the details of the everyday life in modern Romania. Dr. Romeo Aldea (Adrian Titieni), the film's protagonist, wants to make sure his daughter Eliza (Maria Dragus) doesn't lose her upcoming scholarship to Cambridge, which he views as a crucial chance for her to escape Romania for a land of better opportunities. Via numerous long takes, he spends a lot of time driving around, speaking to various bureaucrats, and running chores. It's so realistic it's practically a documentary... except for the fact that the melodramatic complications pile up as rapidly as in a soap opera. First, Eliza is sexually assaulted on her way to school just before taking her final exams, prompting the good doctor to call in some favors on his daughter's behalf. But that's just the start of it. In an approximately fifteen minute sequence in the middle of the film (spoiler alert, if you're the sort that cares), Eliza discovers (or reveals that she already knows about) Romeo's affair with a patient, Romeo's ailing mother has a grave medical scare, his wife kicks him out of their home, and law enforcement shows up out of he blue to investigate some of Romeo's previously mentioned dealings to help Eliza. And then things start getting really complicated, but still with plenty of long takes. “Graduation” is structured around other contrasts as well. Romeo views himself as a morally righteous old-schooler nobly willing to sacrifice his virtue to navigate a corrupt bureaucracy and win his daughter a better future. Yet, one of the first things we learn about Romeo is that he's having an affair which also may or may not explain the fact that this ostensibly quiet film begins with the sound of shattered glass when a rock is hurled through the Aldea family's apartment window. A friend of Romeo's also reminds him of the time a man helped get them out of military service when they were teenagers, and how said man could really use a new liver right now and maybe the doctor could look into helping with that. Mungiu doesn't overtly inject any sense of moral judgment on the proceedings, preferring simply to observe his characters and their circumstances closely, seemingly with a mixture of amusement and bemusement at the convoluted social structures these strange human creatures have built for themselves. The film never collapses into despair, however, no matter how much the noose tightens around Romeo's neck. This is due in large part to the fact that Romeo balances hard-learned cynicism with the still smoldering ashes of the optimism that led him to come back to Romania many years before. He bemoans the inability of his generation to make any real changes, but retains faith that his daughter's might still be able to pull off the job. He even defends the nosy investigators who try to bully him: “They're young. Maybe they'll make things better.” Romeo doesn't sound too convinced, but maybe surely beats a definite no. The film is presented in its original 2.39:1 aspect ratio. Nothing much to say here. “Graduation” is a recent film shot digitally and immaculately preserved in this 1080p transfer from Criterion. Looks great, as you'd expect. The film is presented with a DTS-HD Master Audio 5.1 surround audio mix. The lossless sound is flawless and helps convey the sense of space in many of the film's frequently visited locations. Mungiu rarely uses non-diegetic music in his films, but Romeo listens to classical music in the car, and that is treated well in this surround mix. Optional English subtitles support the Romanian audio. Criterion hasn't packed this Blu-ray release with extras, but they've offered a few interesting features. An interview with the director (2018, 29 min.) is recorded specifically for Criterion. Mungiu speaks in general about what motivated him to make the film, but doesn't delve too deeply into detail. It's great to hear from Mungiu, but there's not much revealing information here. The disc also includes the Cannes Film Festival press Conference (2016, 42 min.) in which director and cast field questions about the film that netter Mungiu a Palme d'or for Best Director (shared with Olivier Assayas). These press conferences are seldom riveting enough to watch in their entirety, but, hey, you can watch it in pieces at your leisure. The slim insert booklet features an essay by film critic Bilge Ebiri. 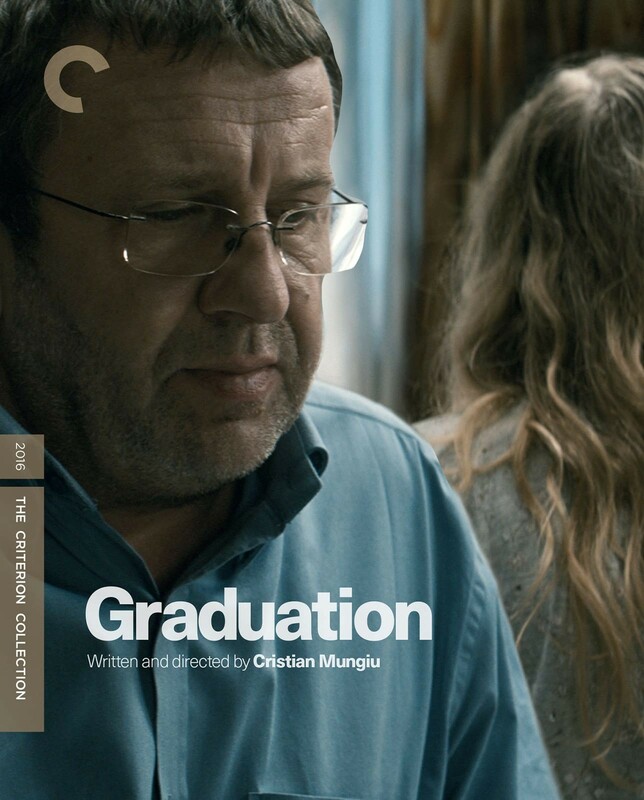 “Graduation” is only Mungiu's second solo feature film since his breakout hit “4 Months, 3 Weeks, and 2 Days” ten years ago. I don't think it matches the high standard set by that film, but it's a potent reminder that Romania continues to produce some of the best films of the 21st century.